This past weekend, the University of North Dakota hockey team entertained the Providence College Friars in a two-game non-conference tilt at Ralph Engelstad Arena. 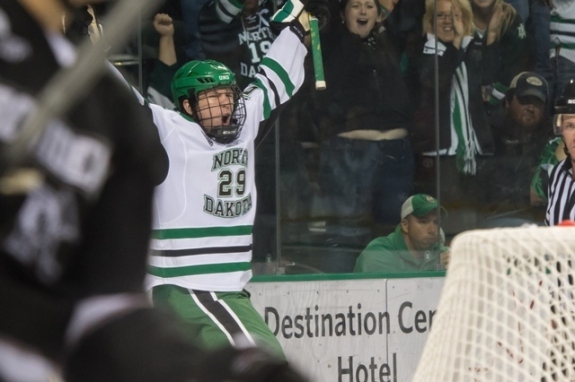 UND beat the Friars 6-1 on Friday night and tied them 2-2 on Saturday night. Here are my three takeaways from the UND vs. Providence series. After starting the 2013-14 season with a 2-5-2 record, UND goalie Zane McIntyre went 18-5-1 with a NCAA-leading 1.72 GAA and a .933 SV% in his last 24 starts. This season, McIntyre has picked up right where he left off. Through six games, McIntyre has gone (4-1-1, .750, 1.93 GAA and a .935 SV%). McIntyre is ranked third in the NCHC for GAA and save percentage. Nationally, he’s ranked 15th for GAA and 17th for save percentage. After Saturday’s 2-2 tie, McIntyre had this to say about the high-profile series between UND and Providence. Coming into the season, goaltending and defense was supposed to be the strength of this hockey team. So far this season, that has proven to be true. First, it’s early in the season. Also, the cumulative record of UND’s opponents is not very good (4-9-1, .320). However, that being said, the UND defense has played well. Since the first game of the season, UND has only allowed two even-strength goals. Regardless of who they’ve played that stat is nothing to sneeze at. Also, you can only play who’s on your schedule. Additionally, Providence was selected to finish first in the 2014-15 preseason coaches’ poll. Let’s take a look at the stats. UND is tied for first in the NCHC for goals against and eighth nationally in scoring defense. Nationally, UND has two defensemen ranked in the top 20 for points per game by defensemen (Paul LaDue 3g-4a—7pts 9th, Troy Stecher 0g-6a—6pts, 12th). Looking at those numbers, it would appear that UND is doing something right defensively. On Friday night, late in the second period, senior forward Mark MacMillan was cut on the wrist by an opponent’s skate. Saturday morning, MacMillan had surgery on the lacerated wrist. MacMillan’s is out indefinitely. Losing MacMillan for extended period of time is a big hit for UND. MacMillan leads all of UND’s active players scoring (35g-46sa—81pts) in 127 games. UND has incredible depth at the forward position, but the loss of MacMillan is a big blow to the UND power-play and penalty-kill. Someone in the UND lineup will have to step up in his absence.